While the cost of visiting Myanmar is increasing every year, it’s still easy to travel in Myanmar on a backpacker’s budget of $50 a day or to enjoy a more comfortable trip on a budget of $75-100 a day. For a five-star experience in Myanmar, expect to spend about the same as you would in Thailand or Vietnam: $200+ per day. For a sense of what you can see and do in Myanmar, see our 1 week Myanmar itinerary and, if you have more time, our 14 Day Myanmar itinerary. The national currency of Myanmar is the kyat, which is available in banknotes from one kyat to 1,000. The largest banknote, 1000K, is worth roughly $1 US dollar. Due to the simple exchange rate, most hotels and tours are priced in US dollars. As in Cambodia and Laos, the US dollar doubles as the unofficial currency of most tourist-focused businesses in Myanmar. You’ll need kyat for food and drinks, but it’s worth carrying plenty of US dollars to pay for hotel rooms and bus tickets. Aside from select Asean nations, travellers from most countries will need to have a visa in order to enter Myanmar. Myanmar offers an eVisa for over 100 countries for $50 – you can apply for this on the eVisa website or, if you’re already in Thailand, get a Myanmar visa at the Myanmar Embassy in Bangkok. Until recently, there were very few ATMs in Myanmar. Today, it’s easy to find ATMs in Yangon, Bagan and other areas popular with tourists. 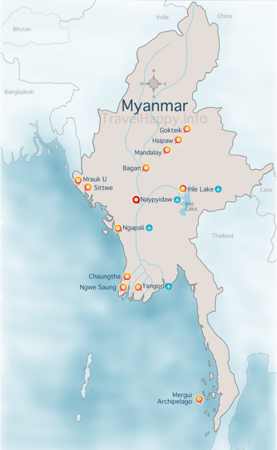 Despite the increasing ATM coverage, you’ll want to bring most of your spending money with you to Myanmar. ATMs are often unreliable and low withdrawal limits mean that you could easily end up spending a lot on bank fees. 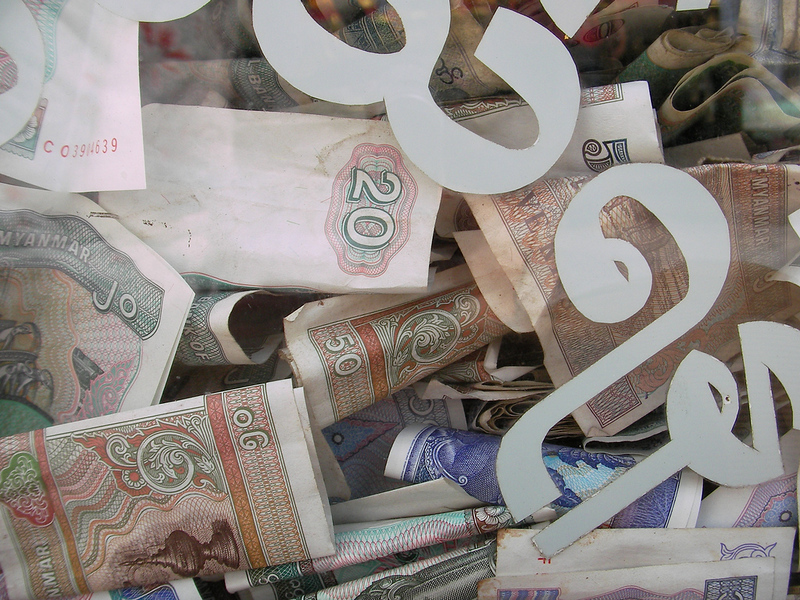 Withdraw US dollars before you depart for Myanmar and bring them – it’s easy to find currency exchange shops while you travel. While some high-end hotels will accept credit cards, restaurants and travel agencies will only take cash. Travelling in Myanmar can be cheap, but high accommodation costs mean you will probably end up spending more than you would in Cambodia, Laos or, if you’re on a shoestring budget, even Thailand. If you’re comfortable staying in guesthouses and hostels, a budget of $50 per day is enough to travel reasonably in Myanmar. With $50 per day to spend, you’ll have no problem visiting most attractions and eating local Burmese food. For a comfortable three-star experience, budget $75 to $100 per day. This will allow you to stay in comfortable three-star accommodation, enjoy a better range of dining options and sleep with an air conditioner instead of a ceiling fan. Accommodation in Myanmar is much more limited than Thailand. Guesthouses are easy to find, relatively cheap, usually quite comfortable and ideal for travellers on a strict budget. In Yangon and Mandalay, you’ll be able to find simple guesthouse rooms from $20 to $40 per night. For this price you’ll get a twin or double bedroom. Cheaper hotels are generally a 10-15 minute trip from the city centre. There’s no dedicated Yangon airport hotel, but there are several reasonably priced hotels near Yangon airport if you need to make an early start. 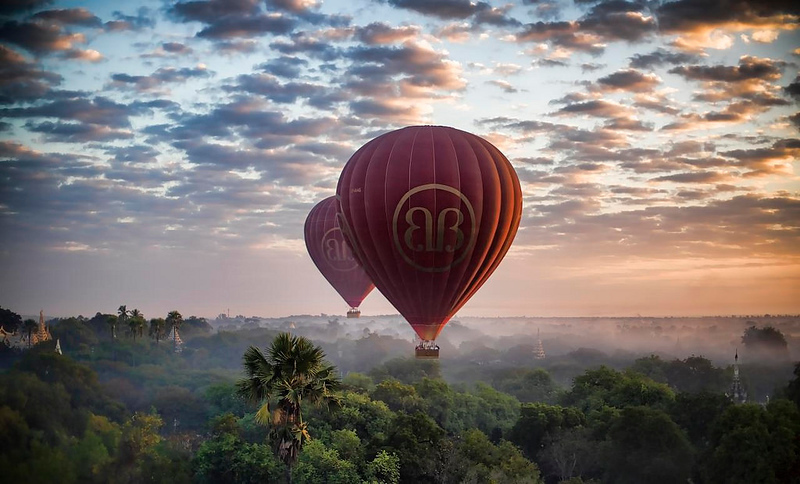 In Bagan, limited supply and huge demand mean that you’ll struggle to find hotels or guesthouses for less than $30 a night. Expect to pay double the rate of similar rooms in Yangon and Mandalay for a room in similar condition. 3-4 star hotels in Yangon and Mandalay are available from $60 to $100. Myanmar’s two biggest cities are also home to a range of luxury hotels priced from $150 all the way up to $600+ per night. Royal Star Guest House: Comfortable, clean and centrally located. Twin and double rooms are available from $35 per night with Wi-Fi and breakfast included. Mother’s Home Motel: Comfortable budget accommodation in East Yangon. Twin and double rooms priced from $38 per night with Wi-Fi and breakfast included. 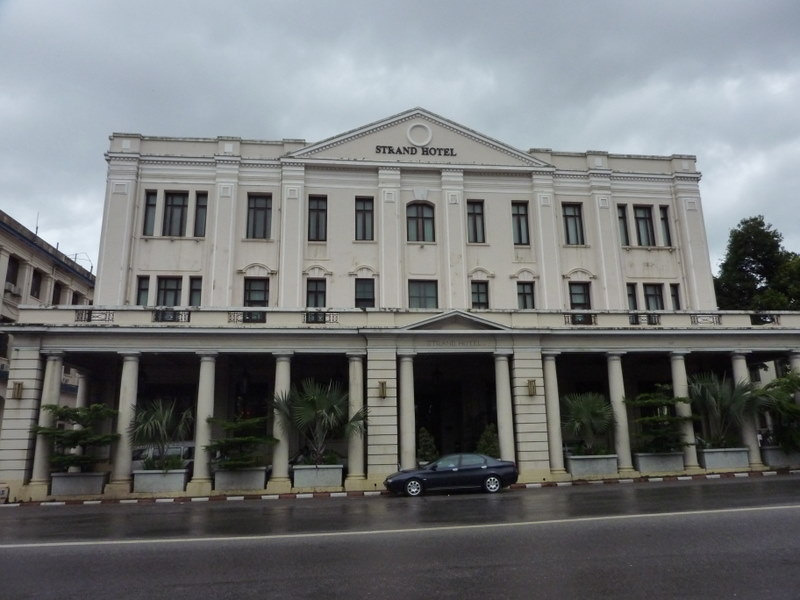 MK Hotel: Centrally located three-star hotel in Yangon. Double rooms start from $60 per night and include free Wi-Fi and breakfast. Mr Lee Hotel: Comfortable three-star hotel located close to Lanmada Railway Station. Double and twin rooms available from $58 per night with Wi-Fi and breakfast. Sule Shangri-La: Spacious, comfortable rooms and a great location in Downtown Yangon make the Sule Shangri-La a good choice for luxury travellers. Double rooms from $215 per night. Belmond Governor’s Residence: Yangon’s most luxurious hotel, Belmond Governor’s Residence offers a variety of luxurious rooms in a beautiful 1920s colonial residence. Located in the centre of Yangon’s embassy district. From $544 per night. 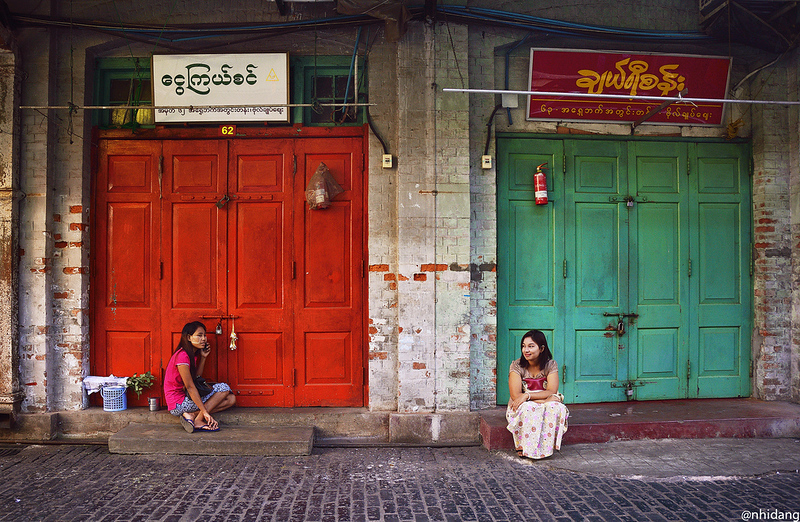 See also our guide to Things To Do In Yangon if you need inspiration. Northern Breeze Guest House: Stylishly decorated and conveniently located guesthouse in New Bagan. Double rooms with free Wi-Fi and breakfast available from $39 per night. Amazing Bagan Resort: Beautiful four-star hotel located close to Historical Bagan. Standard rooms and bungalows priced from $134 and $191 per night with free Wi-Fi and breakfast. For more on Bagan, see Bagan’s Essential Temples and also my crash course in Bagan’s history. 81 Hotel: Centrally located three-star hotel in Northern Inle Lake. Double and twin rooms with free Wi-Fi and breakfast available from $52 per night. Pristine Lotus Spa Resort: Beautiful five-star hotel with traditional décor and a quiet location. Rock pools, spacious rooms and great dining make it a fantastic romantic escape. Floating duplex rooms from $156 per night. Night Sweet Hotel: Clean, cosy rooms with free Wi-Fi and breakfast from $25 per night. Located in Eastern Mandalay. Ideal for budget travellers and backpackers. Sedona Hotel Mandalay: A modern five-star hotel located on four acres of landscaped gardens in Eastern Mandalay. Double rooms with free Wi-Fi and breakfast from $230 per night. 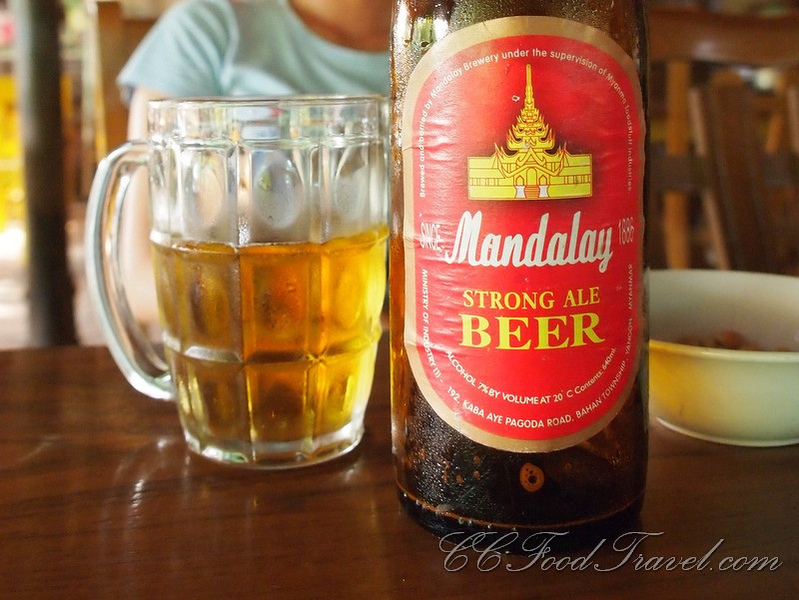 Find out more about Mandalay, see Things To Do In Mandalay. While accommodation in Myanmar is more expensive than in Thailand, food is tasty, cheap and incredibly easy to find. Rice, noodle and curry dishes such as mohinga or biryani are easy to find and cost as little as 1,000 kyat in lots of local restaurants. Other cheap Burmese snacks include dosa, which is available from just 200 kyat, and deep fried stuffed tofu. Local restaurants and street carts are your best bet if you’re aiming to eat cheaply, with filling meals available for 1,000-5,000 kyat. If you eat at local restaurants and stick to Burmese food, it’s possible to spend $10 or less a day on food in Myanmar. Western food is surprisingly easy to find in Yangon, with everything from pasta and pizza to French fine dining on offer. Prices for Western food range from 5,000 kyat to 50,000 kyat or more at high-end restaurants in Yangon’s luxury hotels. 999 Shan Noodle Shop: Tasty, inexpensive noodle soup dishes. 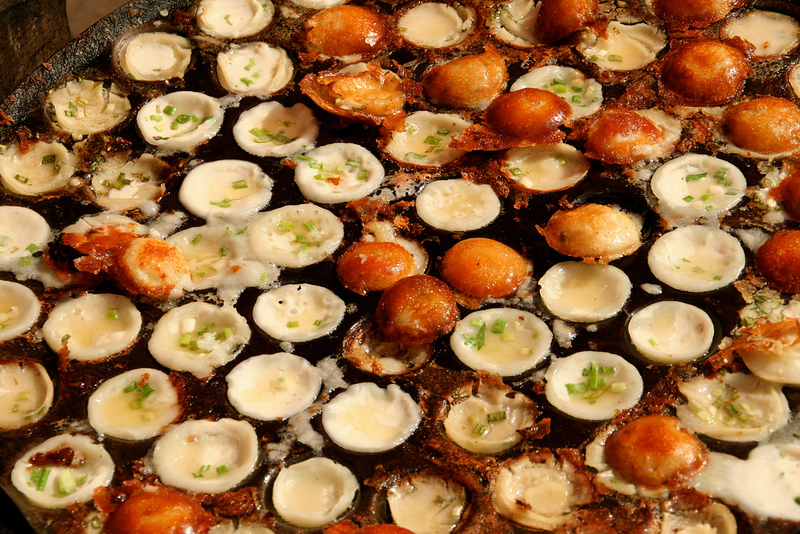 Priced from $1 a meal, making it one of the most affordable (and popular) restaurants in Yangon. 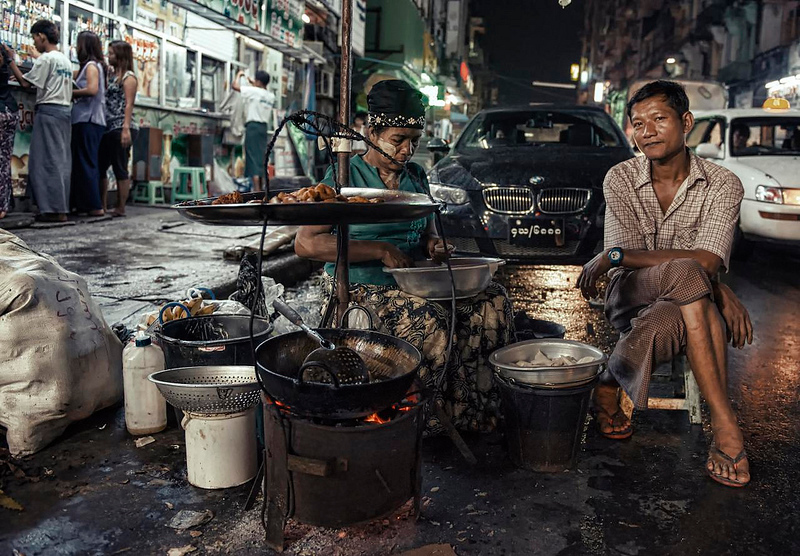 Feel Myanmar Food: A favourite of locals and visitors to Myanmar alike, Feel Myanmar Food serves a mix of Burmese dishes. Meals start from just $1 per dish. Yangon Bakehouse: Good coffee and great baking at affordable prices. One of Yangon’s top cafés and a favourite for its sandwiches. Baked goods priced from $2 up. Le Planteur: One of Yangon’s best fine dining establishments, Le Planteur serves classic French food with ingredients flown in from France. World class food with prices to match. Mandalay Restaurant at the Governor’s Residence: Burmese and European food served in a stunning colonial home. Home to one of the city’s best fine wine lists. You can also see our review of the Governor’s Residence hotel. Nightlife in Myanmar isn’t the most exciting in the region, but if you stick to the local bars (known as “beer stations”) you’ll be able to enjoy a night out without spending more than 1,000 kyat per beer. Expect to spend around $5 per drink in more upmarket places. Most Western bars in Myanmar are found in Yangon or, in other locations, inside hotels and resorts. Cigarettes are cheap – a pack of Marlboro costs around $2 USD, and local brands are even cheaper. Travelling around Myanmar isn’t expensive, although buses aren’t as cheap as they are in Vietnam or Cambodia. Long distance buses like the nine-hour journey from Yangon to Mandalay cost $13 or $22 for a more comfortable VIP bus. Myanmar’s slow road transportation makes flying a good alternative. Return flights from Yangon to Mandalay (a 90-minute journey each way) are available from $290 on Air Bagan. Check Skyscanner for availability and exact pricing. 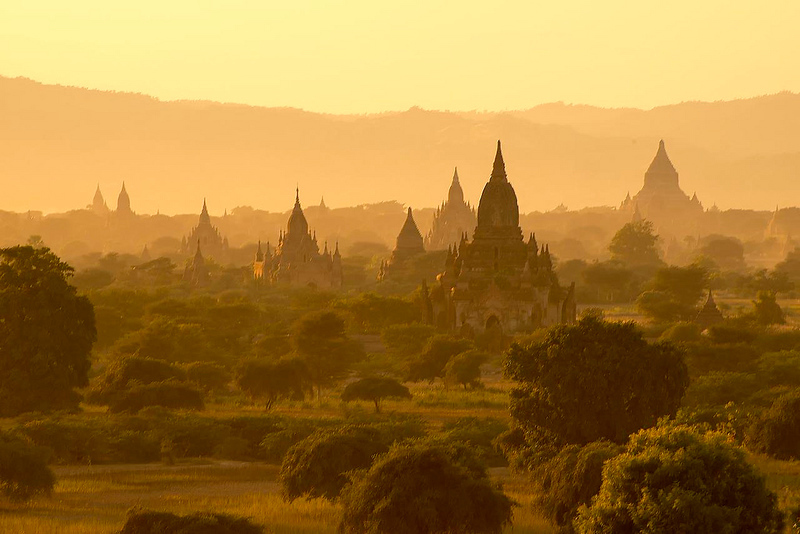 Flights from Yangon to Nyaung U, the airport closest to Bagan, are available from $276 return on Air Bagan. Return flights to Thandwe, the airport close to Ngapali Beach, are priced from $256. Again, check Skyscanner. In Yangon and other cities, taxies are the easiest way to get around. Fares are always negotiated in advance and start from 1,500 kyat, with trips to or from the airport in Yangon priced at a flat rate of $10 each way. 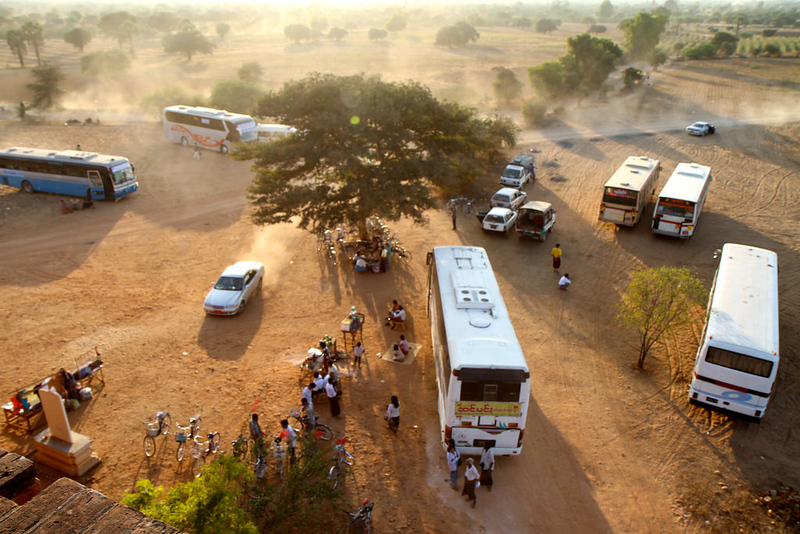 In Bagan and Myanmar’s beachside resorts, transportation ranges from horse carts to bicycles. Travel costs can range from $5 to $20+ per day, depending on whether you’re happy walking or frequently take taxis and private buses. Exchanging kyat is difficult once you leave Myanmar, with few currency exchange shops accepting it. Make sure you spend your kyat before you leave the country or you’ll end up with unusable (although extremely low-value) notes in your wallet. Finally, as with travel anywhere, ensure you have travel insurance for your trip to Myanmar. Medical care for anything serious will probably mean you’ll need to be medivac’d to Bangkok. World Nomads provides coverage which you easily buy and extend online.